Many remember the days when the grill reigned supreme on the backyard patio. Accompanied by a table or two, it was where company would gather, awaiting the Grill Master to bestow upon their plate delicious char-grilled goodness. Lately, though, there is the growing trend of an entire outdoor kitchen…providing companions for, and, perhaps, stealing a bit of thunder from, the grill. The ever increasing popularity of outdoor kitchens has brought features such as wood burning ovens, refrigerators, bars, sinks, and even TV’s onto the backyard patio. 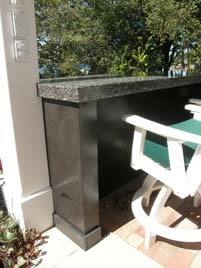 Central to the functionality of the outdoor kitchen is the countertop. 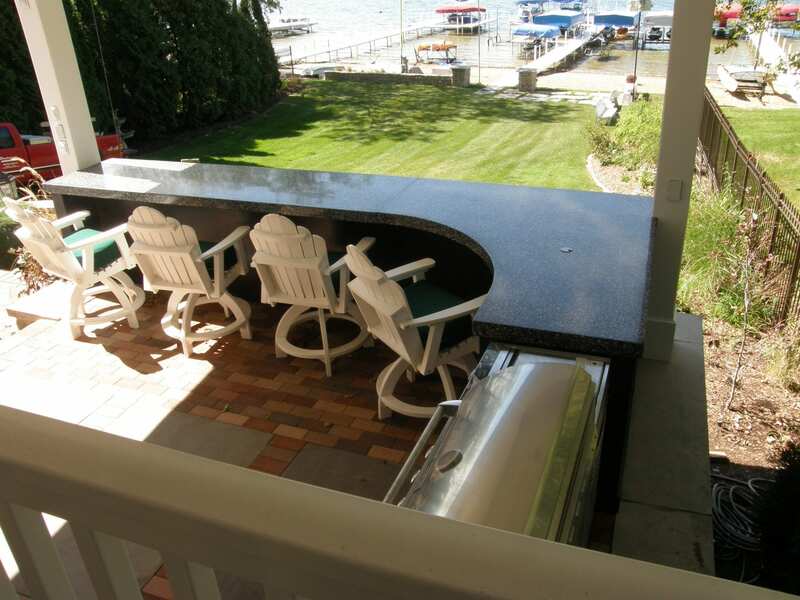 Since the elements are a factor in any outdoor space, custom concrete countertops have been a highly acceptable choice for outdoor kitchens. This massive custom terrazzo countertop in Syracuse, Indiana was designed especially to blend with the aesthetics of the entire outdoor area. Bontrager Concrete, of Nappanee, Indiana constructed the 1,000 pound terrazzo countertop and the supporting base. 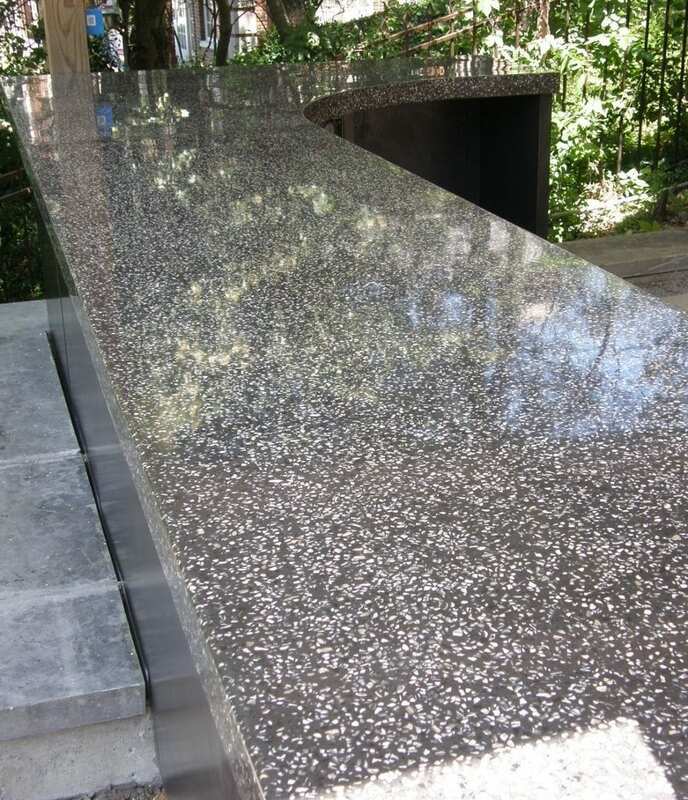 The custom terrazzo countertop was made with SureCrete’s Xtreme Series Terrazzo Mix (specially formulated to have aggregate added to it) with charcoal color packs and mother of pearl fragments. The contrast of the mother of pearl fragments against the charcoal background is dramatic, a characteristic further emphasized be the striking 3” profile and polished finish. 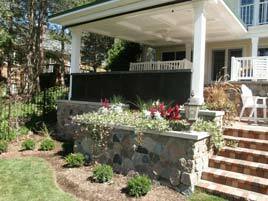 The custom countertop was made in two 500 pound pieces and had to be moved into place atop the base with a forklift. The terrazzo countertop is supported by a concrete wall that is faced with ¾” wall panels made by using the Xtreme Series PreCast System with charcoal color packs added. This unique two part system is easy to use and needs no added reinforcement, allowing the mix to be poured thinner than typical concrete. 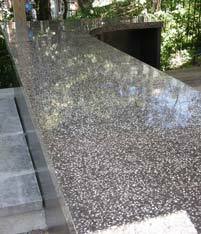 The terrazzo countertop as well as the base was coated with HS-327 Hybrid Water-Based Polyurethane. This sealer is an excellent choice for outdoor kitchens, as XS-327 is highly resistant to scratching, staining, UV damage, and heat damage and is food safe after it has cured.